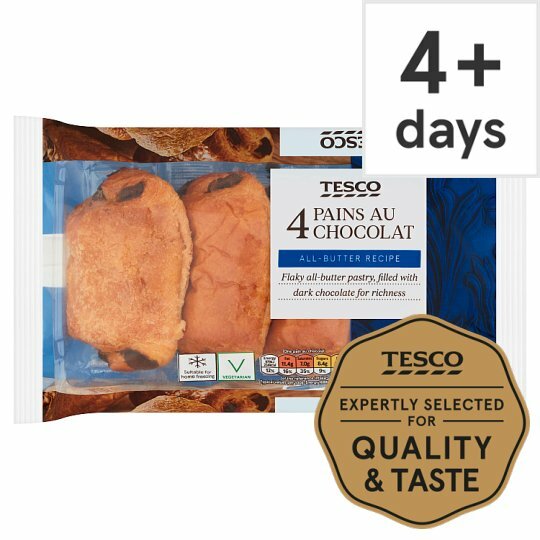 4 All butter pains au chocolat. All butter recipe. Flaky all butter pastry, filled with dark chocolate for richness. Best enjoyed warm from the oven, together with a freshly brewed cup of coffee. Wheat Flour (Wheat Flour, Calcium Carbonate, Iron, Niacin, Thiamin), Dark Chocolate (22%), Butter (Milk) (18%), Water, Sugar, Yeast, Salt, Pasteurised Egg, Dried Skimmed Milk, Flour Treatment Agent (Ascorbic Acid). Dark Chocolate contains: Sugar, Cocoa Mass, Cocoa Butter, Anhydrous Milk Fat, Emulsifier (Soya Lecithins). Instructions: 180°C/Fan 160°C/ Gas 4 4-5 mins Place on a baking tray in the centre of a pre-heated oven for 4-5 minutes. Instructions: 180°C/Fan 160°C/ Gas 4 5-6 mins Place on a baking tray in the centre of a pre-heated oven for 5-6 minutes.